Birding Is Fun! : Where is the birding mentor? In a recent article in the American Birding Association's magazine Birding there was an interview with Wayne R. Petersen of Massachusetts. He has been birding in the area about 50 years and has some insightful comments about how birding has changed in the past half-century. "The speed with which birding knowledge is acquired and exchanged, along with the tremendous sophistication in the birding resources available to birders today, has helped level the playing field for birders--male and female, young and old." "I have noticed a gradual languishing of bird clubs, a decline in participation in organized field trips, and a shrinkage in circulation of printed publications." In other words, while there is more information about birds available, it seems less people are taking advantage of the traditional means to learn. That begs the question, how, exactly, are birders learning to get better at their hobby? Judging from the research I did in February ("Ten most misidentified birds in the Pacific Northwest") it seems that despite the widespread dissemination of identification material, the birds that were difficult to identify 40 years ago still give many birdwatchers trouble. Hammond's Flycatcher. 29 May 2010. Malheur NWR, Oregon. Photo by Greg Gillson. Why do I find this disturbing? Because of the supposed tens of millions of "birdwatchers" in the United States. I'm not the only one who finds this number unbelievable. 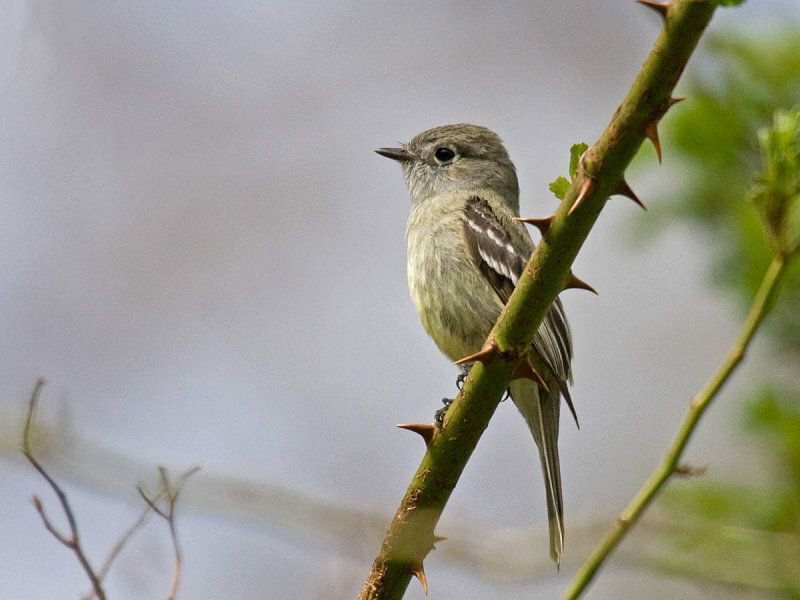 My contrary response is, birdwatchers are those who can identify a Hammond's Flycatcher on sight. Or, at least, they should be striving toward that goal. Perhaps it is my perfectionism that drives me to be the best I can be at what interests me. Not everyone needs to pursue this goal of increasing birding skill, nor should they. But if there are, indeed, anywhere near the supposed 20 million birders, at least quite a few should desire to increase their skills so that they could, if they wanted, learn to identify Hammond's Flycatchers and other more difficult to identify birds. Getting off my soap box and back to my point, how can birders who want to increase their skills do so? Where are the birding mentors? If field trip organization and attendance is down, how are the masses of birdwatchers learning? Or are we "leveling the playing field" by creating a nation of feeder watchers and bird festival attenders and not more expert birders? Even the American Birding Association, which once was the go-to organization for advanced bird identification, has spread out its wings to be more open to beginning birders. I love the ABA and Birding magazine. I understand the business decision to welcome all levels of bird watching with open arms and wallets. But then do we need to create another organization to teach advanced birding? Field craft skills, birding by ear, identifying birds in flight, status and distribution. Is there something out there already where birders can (and do) find answers to their questions? Who or what is your birding mentor? Tell me, where do you go to learn to identify Hammond's Flycatchers? What a gorgeous little beauty!!! Interesting post, with a lot to consider. I do find your comments and concerns about the ABA to be a bit mystifying in places, though. Yes, we're moving to be more welcoming and inclusive, but I don't follow how you get from there to musing about the, "...need to create another organization to teach advanced birding?" The resources and the people who can help you learn to identify Hammond's Flycatcher are still strong at the ABA, and will continue to be. By welcoming in more birders, we're increasing the pool of people who may wish to take the path of grappling with advanced identification, at least as I see it. What reason would there be to form another group of advanced birders, except to promote an aura of exclusivity, one of the main things that lead to the ABA's decline in membership through the late 90's and 00's? I'm not trying to be argumentative. But I am trying to engage in discussion. I care about birding, about ID skills, and about the ABA and I can see that you do, too, Greg. So I'm really interested to have this part of your post fleshed out a bit. Jeff, ABA is to be congratulated on improving its offerings and scope in the past couple of years. Birding magazine has improved quite a bit, in my opinion. The January/February 2013 issue is quite good, I think. I hope it continues the variety and quality of that issue. It has an ID article on Lesser Black-backed Gulls and a status/distribution article on Common Black Hawks in Arizona. Each issue has a Photo Quiz with 3 photos (usually). But are these enough to teach bird identification beyond the field guides? Even a year's subscription barely scratches the surface. I wish all birders owned Kaufman's Advanced Birding and Alderfer and Dunn's Birding Essentials (or Sibley's Birding Basics). But even owning the books doesn't mean that they are learning. I think birders still need some kind of mentor at the local, personal, level. Who teaches birders that Swainson's Thrushes aren't expected until May--that those migrant April look-a-like thrushes are Hermit? Who teaches visiting Eastern birders to the Pacific Northwest that these are Song Sparrows and not Fox Sparrows? Who teaches birding by ear or identifying birds in flight? This isn't exclusivity--it's broadening the scope of identification skills. Especially status and distribution, but also birding by ear, needs to be done at the local level. Although, certainly, I could see a national organization taking the lead with local chapters. But nothing like that exists. My question remains: Where is the birding mentor? Greg, I think what you are describing are normal hurdles beginners learn over time to overcome. eBird has helped me a lot in understanding when birds "should" or "should not" be around. eBird in fact has been one of my strongest birding mentors. I agree, Robert. eBird can be a great tool for learning status and distribution. How does one turn it from "can be" to "is" for more people? Greg, interesting post, and I think I know where you are coming from. Perhaps my example will be illustrative as I am still a fairly new birder (it will be nine years this summer) and I am growing up as an internet birder. My father-in-law introduced me to birding, but we never really got into "advanced identification skills" together. The internet, books, and birding magazines have been my mentors in identification tips and tricks. I've birded with many great birders and I pick up bits and pieces from them too. I do desire the ability to identify every bird that I see and/or hear. I still struggle with the dang flycatchers, among other bird families. I have refresh my knowledge with study every year as the difference between Dusky, Willow, Gray, Hammond's etc all seem to freeze out of my brain during the winter. I don't know that the desire to identify all is required to be defined as a "birder". People enjoy birding at so many different levels. I find the ABA and its many public faces (publications and online presence) to be a great resource for advanced bird identification. And I'm glad that it doesn't have the exclusive connotation it once had. I seriously thought I'd have to have seen 500 species before I could have joined a few years ago to be considered part of the elite club. The internet has certainly made for hundreds of new resources for becoming bird identification experts. People can share their images and experiences with much more ease to a vast audience. I think birding is on a good course due to the democracy of knowledge as a result of the internet. Personal connections are still being made in the field and are very enjoyable, even if I don't attend bird club meetings. Robert, I agree that the information is "out there" somewhere in "internet, books, and magazines." But how does a birder find and organize those "bits and pieces"? You did it on your own, even as I did (though aided at times by association with other birders). Even assuming that a birder could somehow know that such information must exist, how do they find it? How do they even know what kind of information exists? How do they know they are misidentifying (or simply failing to identify) birds? Is there any group or individual doing that today? (I'm thinking of how Ludlow Griscom influenced birders in his day, including Roger Tory Peterson.) It'd be interesting to know if such mentors exist today--or even if it is necessary. Baicich, P. 2006. Where Are the Imbuers? Birding 38.5: 64-69. Easily one of the most important essays we published under the Sources rubric, asking precisely the questions asked above and offering a thoughtful and subtle discussion of the issues. Thank you for the reference to Paul's article, Rick. Even after several recent moves that issue was fortuitously still on my shelf! "We nevertheless lack teams of experienced human interpreters who will take the curious, with their first bird guides and binoculars and turn them into the passionate." "The internet and other mass media technologies have eased the transmission of information, but not necessarily our access to it." "'Having bird-identifying mentors is at least as important as binoculars and field guides.'" "With all the tools, with all the field guides we have, how come there are so many people still not fervent about birds?" Thanks for leading me to this Rick. It appears this article from 2006 was saying exactly what I was getting at. An interesting post. Maybe I can help answer your last question (where do you go to learn how to identify Hammond's Flycatchers?). I grew up birding, since I was 7. My mom passed on the love of birds to me, but I mostly taught myself. Hours spent pouring over field guides (and horrendously misidentifying common birds). Even into college, I mostly birded alone, and taught myself. I didn't even know there were birding listservs, or a birding sub-culture, until I started working temporary field jobs after college. I learned a lot from the people I worked with (including how to ID a Hammond's Flycatcher, at the Idaho Bird Observatory in Idaho), but still, I learned most of my birding skills from pouring over field guides, and practicing in the field, and finding internet resources (Ebird has been an awesome resource for learning status and distribution of birds). I'm not saying that we don't need mentors, but it's increasingly easy to teach yourself to be a better birdwatcher. Maybe that's a good thing, maybe not, but I think the hobby (sport? profession? madness?) has grown far too much for everybody to follow the same path, for everyone to be a part of some greater organisation. There are so many different kinds of birders, many of whom will never be able to ID a Hammond's Flycatcher, either through a lack of desire or a lack of knowledge, or some combination of both. For me, it was a combination of books, the internet and other people who taught me, but it was mainly my obsession to know more about birds that drove me. And that's something you either have or don't. Obsession. Yes, that's it, David. Better birding skills you can teach. Obsession is innate. I'd argue that birding will always have a range of skill levels, and people who aspire to a range of skill levels, like every hobby. You can't expect all, or even most, birders to be able to visually identify empid flycatchers, it's just not possible. You can't even expect them all to want to learn that. Not everyone gets their enjoyment of birds from pushing their knowledge and identifying tough birds. Some just enjoy looking at birds, and are ok not knowing what they are. For instance, I'll always be a mediocre-at-best photographer. I'll probably never really learn the names of all the butterflies I see, despite the field guides I possess. That doesn't bother me, and no amount of mentoring in those fields will likely change that, that's just not where my real interests lie. The same is true for birds. I agree, there should be mentors available for those who truly want to learn. I'd love it if my local audubon society had walks aimed to practicing identification skills. So interesting to read after a big migrant day at South Padre Island. I love birds, people, and birders.There were 3 tours of people at the Convention Center habitat and tons of pair of birders. I didn't notice anyone wearing an ABA article of identification. I bird with Benton Basham. His mind is amazing and so are his eyes. Just a glimpse, about all it takes for most birds. Can't hear and was never an ear birder. Many older men especially can't hear well. (Red and Louise Gambel have the set of skills, her ears fantastic. Anyway, yesterday when Ben had to rest, I noticed newer birders inching closer to catch what he was identifying and listen to his comments. As always, Ben has time to answer any new birders questions or old ones. These founding ABA guys are just amazing to listen to, their set of skills based on huge amounts of fieldwork, banding, volunteering, and education. I found myself introducing myself to singleton birders or pairs, and introducing them to Ben. They had lots of questions. I think friendly encounters, even the "Hi, where are you from?" or "Great day, right? What have you seen today? What has been your best bird" just are like a water drip in a drought! When you go out to these hotspots, tell people how to get with birders locally. Any level of interest is interesting to me. I could not identify a Hammond's. I live in Harlingen TX. My life list almost entirely Texas. I am an ABA member. Thanks for your enthusiastic response, Claire! I wish there was a way to "capture" and use all these fantastic birding mentors to give them to a wider audience. Since I live in western Oregon you can't really get by very well in the woods without birding by ear. Too bad everybody doesn't have access to a place like Cape May. Here, the Cape May Bird Observatory offers some 450 walks and programs A YEAR to help people learn to separate the Song Sparrows from the Fox Sparrows, so to speak. And lots of very good local birders (including a number who lead tours professionally for some of the big tour companies) who are happy to share their knowledge with any and all comers -- both through volunteer activities with CMBO, TNC, NJ Audubon and others, and just through their presence in the field. My guess is, there are a lot of other local Audubon chapters, Nature Conservancy properties, NWR sites, etc. that also offer good, solid, skill-expanding walks and programs to interested birders in their areas. The mentors are out there. They are here anyway! That would be so great! Volunteers are wonderful, but not all the prospective mentors can volunteer, unfortunately. Paid tours reach only a small subset of the birders that could really use a mentor. I agree with a number of David's points. I think of birdwatchers as people who are satisfied by studying their feeder and yard birds. Birders are the people who go out to actively look for birds elsewhere. Birdwatchers (my definition) are probably equally important, if not more important to conservation. For starters, there's significantly more of them. They're going to be the bulk of people putting money into purchasing birdhouses and bird seed. Americans spend $20 billion annually on seed, travel and equipment. And while travel is the biggest portion of that 20 billion, any part of that is significant. I wouldn't want to dismiss their contribution even if their skills are not at the same level as birders or professional birders. When it comes to conservation issues and voting, the birds need every vote they can get. If societies, such as the ABA or Audubon are seen as dismissive of people with a general interest in birds, people aren't going to remain interested. That's not going to help anyone: it won't help them develop skills and it won't help birds at the ballot box. If your standard for labeling people as birdwatchers/birders is ability to identify a hammond's flycatcher from a dusky or a gray, then you're establishing a high standard that is only going to get the most skilled of the skilled. It would be equivalent to asking for someone to identify the difference between scarlet and red oaks, or upland choral frogs from western choral frogs, sea fans from bamboo coral, the list goes on. The suggested standard seems more like a demarcation between master and competent. Also, if this is the requirement, if proclaiming the standards to define one as a birder is the approach birders/organizations are going to take about the hobby, then why would people want to become birders? It's very off-putting. If you want people to be interested in improving identification skills, making birding more accessible is a first step - not scaring them away or dismissing what skills they've acquired. I would love to be a better birder. I recognize that takes time and dedication. It's a developmental process that never ends. However it's very off-putting to be dismissed which happens more often than it should. I generally don't ask stupid questions (only occasionally). I don't belong to the typical demographic of birders. I'm female and younger than most of the people out there. Granted the demographics appear to be changing, but I don't want to wait for walls to break down to be accepted. But if there's an exclusivity club, most people aren't going to stick around long enough to develop the skills necessary to be accepted. Regarding how are people learning? -- I took an ornithology class in college. Took a second in graduate school. I spent a number of afternoons at a hawk watch during the fall migration. I read bird blogs. I went to one local bird club where the next youngest person was probably in their late 50s. Frequently I pursue ebird to get a sense of what to expect. I develop my skill by going in the field by myself, each week and figuring out what I see. I come back, review my field guides, and execute google image searches. I wish I had a birding mentor. I'd learn a lot faster and maybe I would have stuck with birding the first time I became interested. Now I'm going to go back to writing my thesis on kestrels which is where I should have been instead of on birding blogs! So you learned on your own, took classes, and still wish for a birding mentor to increase your skills at a faster pace? I think that's what this post was all about! Very good article. I find birding with those more experienced very educational, and the approach of having a mentor and learning within a club is ideal. I know for myself I am often too busy to get to many meetings or trips with work and family, and have my birding when I can, but then I still label myself a beginner. One great place for mentoring in todays world is the listservs. When a beginner posts as misidentified picture or claims to have seen a bird where it is not likely hopefully more experienced birders will take the time to correct and educate. This doesn't mean telling the person to go review their field guild, or worse to stop posting until they know what they are talking about. The attitude of the listserv mentor is the same as it has always been. Mentors need patience. I have always birded alone because I am very shy, and todays world of information explosion is probably better for my being able to improve my skills than it was 35 years ago when I started. It still depends on people being willing to help, whether it is through ID articles or, or nicely worded responses to a novices' questions. It is a challenge to teach on listservs. It is hard to say in a public forum, without offending: "The bird you reported would be very unusual at this location and time of year. There is another species you should consider as it is common and looks like the one you reported. Here is how you separate them..."
As one interested in status and ID, I know (or suspect) that there are many misidentifications on listservs. Do you let these go so as not to offend, but then perpetuate the idea that a bird that doe not exist locally is being seen? Greg, it is funny that you pose this question, since I just wrote a post on my own blog about my birding mentor. Sadly, she passed away a couple of years ago at the age of 102! Amazing! I must admit that I am still trying to learn my empids and am considering taking a class at the Tucson Audubon. I have read so much but having and expert in the field with me would certainly help. Plus, most field guide do not give enough specific information on these difficult species. And I must confess once again, that I spend more time writing, and birding and processing photos! But, I like to think that I am improving all the time and I do get very frustrated with myself when I cannot identify a bird! But whether it is empids, sparrows or peeps, I find it takes lots of experience with the species to get it right! It is wonderful, Kathie, that you had a birding mentor like that! Now, can you be a birding mentor to someone else? That's a challenge for all of us to take up.